Be it professionals, businessmen, entrepreneurs, salespeople, CEO’s or a student representative; everyone has to make a first impression. Email signature helps you build up to that first idea. When your recipient is closing your email, the signature enables you to create a strong professional and long-lasting image. Now, knowing the importance of your email signature, it is important to understand how to build it up. On one hand the signature should include all the necessary information, but on the other hand, you need to remember that it is a signature and not your biography. Hence, it should not be too bulky. Mostly all the email signatures that you have come across must have these elements. This can become boring after a while, and since it is the impression you leave your reader with, you cannot afford it to be boring. To make it more interesting, here are ten tips you can work on which will improve your signature. Ideally, the signature should not be more than 3-4 lines. Longer the signature, harder it is for the reader, and it will require more attention. It is also difficult to open and view the extended signatures on mobile devices. Prolixity has to be taken care of, especially when you are trying to catch your reader’s attention. It does not make sense to send out an email and mention your email address again. If the reader requires it, he/she can get it from the ‘From’ section. Now it is evident that your company will have profiles on various social media platforms. You can include these social media plugins in your signature. Now you also need to take care that the signature does not become too bulky. Hence, you can hyperlink various texts and can link them to your profiles. When it makes more comfortable for the user to contact your firm, you also need to make sure not to confuse them and hence, do not include more than three social media platforms. Call-to-action, if included in the signature helps hold the readers from leaving. This will direct the recipients to some other page thus holding them back by performing some action. This may be any downloading to be performed, scheduling a demo, welcoming any suggestion, etc. Your signature is something that everyone is receiving your email would go through and hence, you can also use it as a tool for marketing your products. You can also include the link to your best selling product or any blog that outlines perfectly what your products are. It is proven that visuals are easier to remember and more efficient than text, and hence, it is advisable to include an image into your email signature. It is preferably the company’s logo. You should use some bright and colorful images in your signature or your photo. Videos are also more efficient, and people are always eager to watch them. They are entertaining and can create a long lasting image in the viewer’s mind. Adding a link to a video can add uniqueness to your signature. As mentioned earlier, a blog that describes your firm or your product line the best can be included in the signature. This will help engage the reader. You can try writing something interesting as an introduction to your blog which will induce the reader. Any free tool or an open trial session to be provided by the company should be specified in the signature. This helps the readers get an idea about the freebies your company is offering. Freebies are always appreciated and add to the goodwill of the business. Information is the critical resource, no matter what market you are in. This data is added to your signature, can do wonders, as it adds to the fun factor of your signature. Also, the recipients will get more information about the company through this. Create and Send Email Templates with SalesHandy for Free! Wisestamp.com, at a price of just $6.00/pm, gives you hundreds of amazing professional business templates which will help you grow your business. 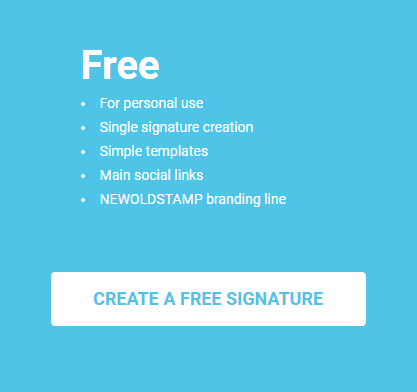 Newoldstamp is a widely known software which provides you a free trial, and you can get a fully personalized and professional signature for your email. However, it’s paid plans start from $24 per year. The rates increase according to more personalizations. With a tagline of “Promote your company with every email,” htmlsig.com aims at boosting your sales. With an aim to strive to make fantastic email signatures for their consumers, zippysig helps you create a high-quality email signature within minutes. Hubspot is a widely known software which helps you with all your sales related needs with a wide variety of templates to generate a perfect signature for you. 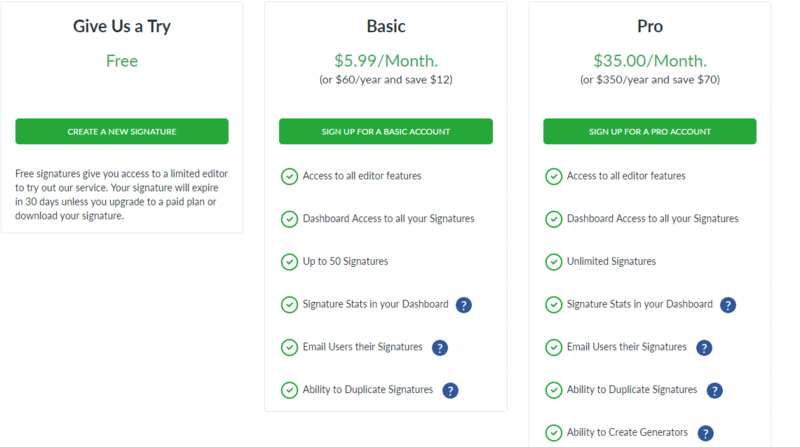 Moreover, it is free, and they charge you only if you need extra services, for the first email signature templates, they provide services free of cost. Starting with a pack of $48.00 per year, which allows you to manage three email signature, Email Signature rescue can be your one-stop solution for your email signature needs. 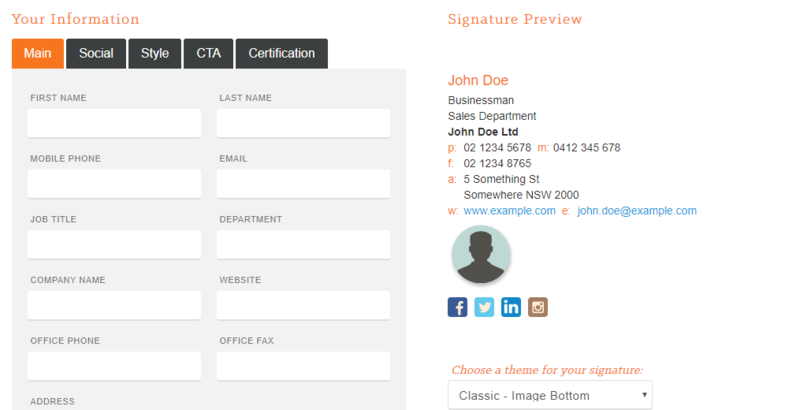 Mailsignatures.com enables the user to generate an email signature for any platform for free and also gives a wide range of templates to choose from. Template.net gives you a professional email signature generator which makes it easier to understand and cater to your needs. It also enables you to generate your signature on any platform. Signaturia is one of the innovative generators which will enable you to generate email signatures for your entire team at one single time. You can also create templates and pass on to your team members. These softwares thrive to provide you with the best signatures and allow you modifications according to your needs. You can get your signatures made for free as well from some of these websites which provide free trials or services. Combining all these essential elements, you can create an email signature; a reader can’t help but click. If you follow all the steps stated above, you will observe a drastic increase in your sales. Not only will these signatures help you create a great impression, but your sales will exceed your targets! What are you waiting for then? Go ahead and create a great signature!